WINDHAM — Raymond has officially informed the Maine Department of Education and RSU 14 of its vote to start the school withdrawal process, and Windham officials are increasingly weighing in on the prospect of a one-town district. Nangle said he’d like to invite Windham’s members of the School Board to speak with the council to discuss the withdrawal process. “I’d like to make sure that our School Board members know that we don’t want them to be negotiating a better deal (for Raymond),” said Nangle, who is up for re-election in November. Councilor Dennis Welch, who is also up for re-election, said he had questions about the withdrawal process and what Raymond would do with its high school-aged students. Chairwoman Donna Chapman said she hopes Raymond stays in the district. This is Raymond’s second withdrawal effort within the last several years. A similar effort started in 2014 and ended in 2015 with Raymond residents voting to halt the withdrawal process. That effort, however, led to an agreement that has lowered Raymond’s percentage of additional district costs over the last three years. Under the current RSU 14 cost-sharing agreement between the two towns, Windham pays 64 percent of additional district costs and Raymond pays 36 percent. Several Raymond officials believe the district is not adhering to the cost sharing agreement, but district officials have pushed back against that assertion. Raymond voters decided to give the withdrawal process another try, voting 171-128 at an Aug. 14 special town meeting to initiate the withdrawal process and set aside up to $50,000 for the effort. “The School Board has been – and will continue to be – committed to ensure that all students and staff within the regional district are provided equal opportunities for the highest levels of education success during this time the town of Raymond files for a petition to withdraw,” RSU 14 Superintendent Sanford Prince said in a statement after the withdrawal vote. The 22-step withdrawal process, as outlined in state statute, involves multiple public hearings, the creation of a withdrawal committee, development of a withdrawal agreement and a sign-off from the Maine Department of Education, among other steps. Raymond’s vote in August was an initial step in that long process. The Raymond Selectboard outlined reasons for initiating withdrawal in a Aug. 21 letter addressed to Department of Education Commissioner Robert Hassan, which was also sent to RSU 14 officials. The reasons, as stated in the letter, include the suggestion that RSU 14 “has been unwilling to view the district as a whole” to transport Windham students to Raymond in order to use available classroom space there. The letter also asserts that the district is not using the revised cost sharing formula to address all costs including the lease of new space. While the letter does not specifically mention the shared vehicle maintenance facility currently under construction in Windham – to be owned by the town of Windham with space leased by the school district – that pending lease agreement has repeatedly drawn the ire of Raymond town officials. “Withdrawal would give Raymond the ability to control its own school unit for the education and best interest of its students, instead of participating in a large school unit in which Windham has the overwhelming vote on the school board,” the withdrawal letter continued. Windham currently has six School Board members and Raymond has three. Chairwoman Janis Cummings is from Raymond, as was the previous chairwoman, Diana Froisland. Chapman addressed the withdrawal push this week during a meeting about the shared vehicle maintenance facility lease. “I just hope this all works out in the end, and Raymond stays with us, goes through the painful portion, because I know there were some hurt feelings and probably it wasn’t communicated the best in an open relationship going back and forth to where we are today,” Chapman said. Raymond Selectboard Chairwoman Teresa Sadak, who has helped jump-start both of the recent withdrawal efforts, attended the council meeting Tuesday night in Windham. She said in an interview after that Raymond is close to selecting its members of the withdrawal committee, which state statute requires to be made up of one member of the Selectboard, one member of Raymond’s general public, one member of the group that filed the petition and one member of the School Board. Sadak declined Tuesday night to say who the potential committee members might be. 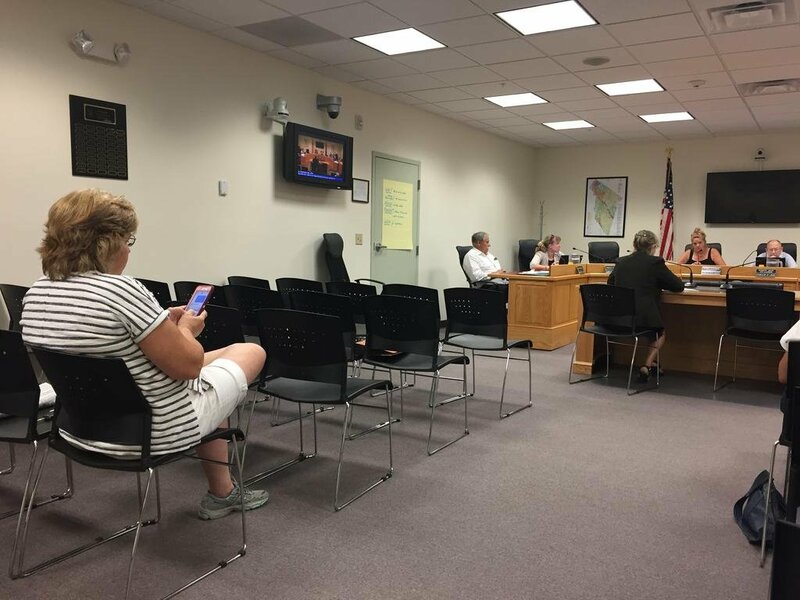 Raymond Selectboard Chairwoman Teresa Sadak was one of the lone audience members at the Sept. 4 Windham Town Council meeting, where the council discussed the proposed inter-local agreement and lease for a new shared vehicle maintenance facility currently under construction in Windham.